Nu är det snart höst och det kan vara dags att uppdatera sin hattgarderob. Kanske med en juvel ur kollektionen Jewels Hiver 1951? Thick ruby red / burgundy / wine-red wool with a velvety sheen draped on a foundation of buckram, millinery wire and felt, and finished off with a thin strand of pearls, using traditional vintage millinery techniques. Hand sewn with silk thread. This hat is a head piece typically used in the 1930s and 1950s. Made for size 56 cm/22'' but works well a size up or down. 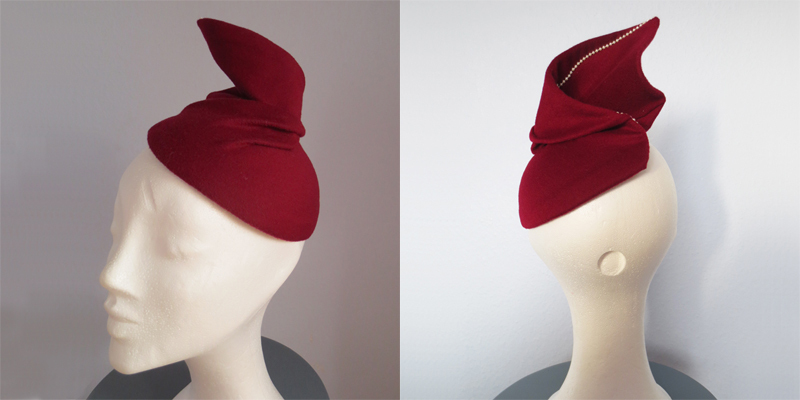 Secure the hat with bobby pins through the petersham ribbon on the inside. The label indicates the back of the hat. 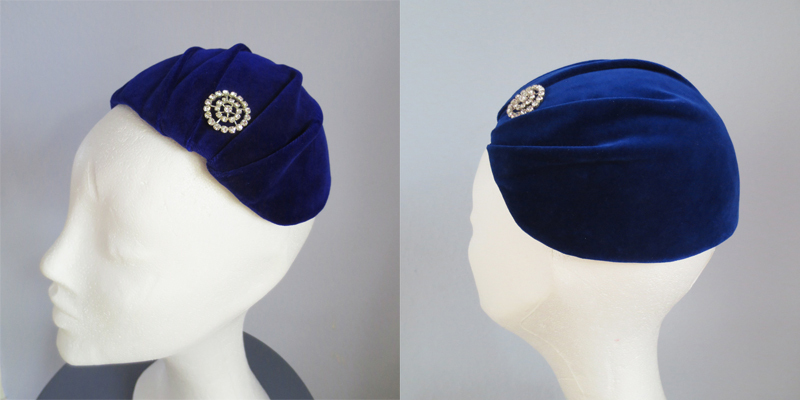 Thick, lustrous vintage velvet in royal / sapphire blue draped on a foundation of buckram, millinery wire and felt, using traditional vintage millinery techniques, and finished off with a vintage rhinestone button. Hand sewn with silk thread. This juliet cap is a head piece typically used in the 1950s. Softly draped purple silk sation on a foundation of buckram, millinery wire and felt, lined with black silk, using traditional vintage millinery techniques. 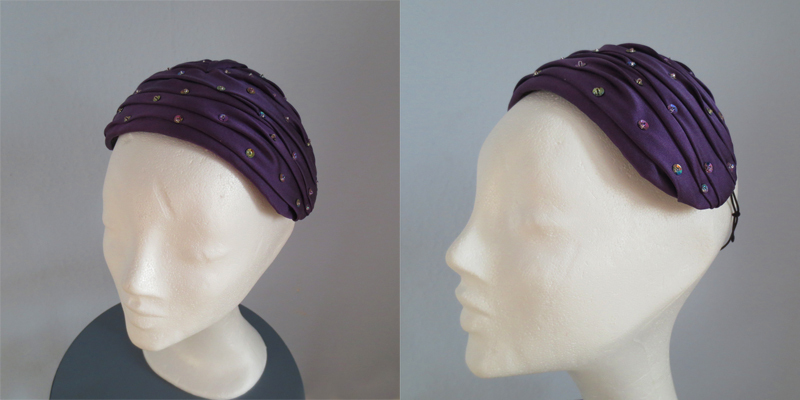 The headband is embroidered with iridescent sequins and beads from the 1960s, bought at a flea market in Paris. Hand sewn with silk thread. This fascinator is a head piece typically used in the 1950s. 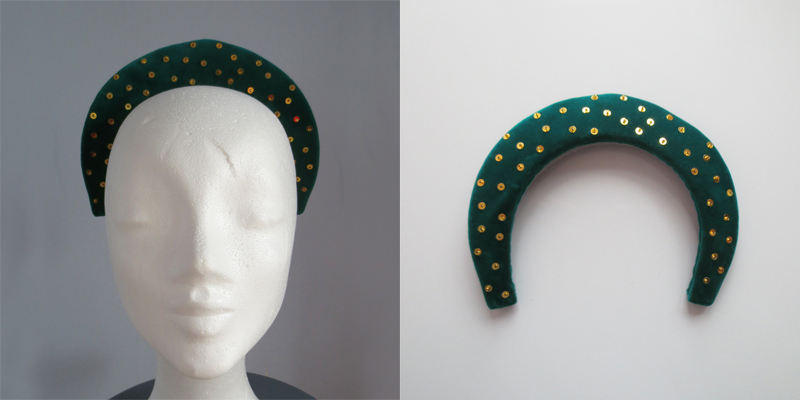 Vintage emerald green velvet on a foundation of buckram, millinery wire and felt, embroidered with vintage gold sequins and beads. Hand sewn with silk thread. The tiara is reminiscent of the Russian Kokoshnik and the dramatic 1940s. A thin headband wraped up in dark yellow / mustard yellow vintage chiffon. The matching dotted veil is also vintage from an old millinery supplier. Hand sewn with silk thread. This head band is a head piece typically used in the 1960s. Made for size 56 cm/22'' but works well a size or two up or down - the foundation is a flexible plastic headband. Flip the veil forwards or backwards depending on your mood; let it cover just your eyes or your whole face. If you want to buy any of the hats, just send me an e-mail! Worldwide shipping is included in the prices. As a buyer outside the EU, you are responsible for any custom duty fees. For sales within the EU, the rules of distance selling applies, which gives you as a buyer 14 days to return the item(s) should you not be satisfied. The items must remain unworn and with tags still attached. The buyer pays for the return shipping fee. For sales outside the EU, returns must be shipped back within 5 days, and remain unworn and with tags still attached. The buyer pays for the return shipping fees, and a re-stocking fee of 15% of the prize of the item. Please ship in the original box and remember to fully insure it. Once I have received the item, you will be refunded.